Years ago like most campers, we did the tent thing, but grew tired of the cold and getting up off the ground in the middle of the night. We upgraded to a tent trailer. At that time, they were pretty basic, a box with wheels and a roof, hard to set up, no creature comforts, permanently damp canvas walls and they don’t keep bears out very well. We upgraded again, this time to a used Bonair 13′ trailer. Very good layout, compact and it had a bathroom. After several years, small leaks developed, as they do in most stick built trailers and we searched for a replacement, maybe a bit bigger. One day we ended up travelling behind a small fiberglass trailer with “Escape” on the back and thought this might be worth looking into. We knew about Bolers and Bigfoots, but not any other makes. In any case, we visited the Escape Trailer Industries (ETI) factory in Chilliwack, BC, Canada. In a small building with few staff, we got a grand tour and were impressed by the operation and that Reace (owner) was able to answer all our questions. We naively thought that other trailer builders would give us a tour, etc, but were surprised that they did not and referred us to their dealer network. We knew about and experienced the general poor quality of the stick built trailers. The dealers were cold and dismissive of us because we wanted a small fibreglass trailer. We immediately arranged with ETI for a 17B to be made to our specifications. Reace had a few reservations about building a trailer without doors, drawers, a modified counter and moving fridge/furnace, but he was very accommodating. Since I like to design and build, I wanted the opportunity to put my stamp on the trailer and make it unique. I had a few rules to guide me, any modifications had to look factory built, were true to my standard of quality and built without adding unnecessary weight. We got the 17B at the end of 2007 and had it until 2014, it did not travel great distances, but it was extremely comfortable, everything worked and when it came time to move on, we sold it for almost what we bought it for. Amazing. As with all stories, this continues with our latest upgrade, a 2015 TA 5.0. The only thing the 17B did not have was a long enough bed for me, so the idea of a full sized queen size mattress was the trigger for this new trailer. Glad you discovered fiberglass Chris. I tell everyone that will listen the virtues of these little campers. I love the look of the 5th wheel and inherent tow-ability but have yet to convince the Mrs. We have had our share of campers over the years, I am 67 and will retire December 2016, and have enjoyed a 10 year old 13ft Scamp that will have to be sold some time this year. We knew that we would not go back to stickies when we retire and travel coast to coast and from Alaska to Key West. Yes molded fiberglass is the way to go and Escape makes a fine trailer. In my previous life, I built fiberglass sailing yachts, so I am very familiar with fiberglass products and how to fix/maintain them. I am also retired, so I can now play. Well well Chris, I knew you were a boat guy when I first saw your trailer’s interior. I suspect a photo hobbyist as well. You know how to use a camera as well as woodworking tools. It’s too bad the North American RV industry is not too interested in moving beyond the 1950s. I say this with regards to design and components they will not budge from. 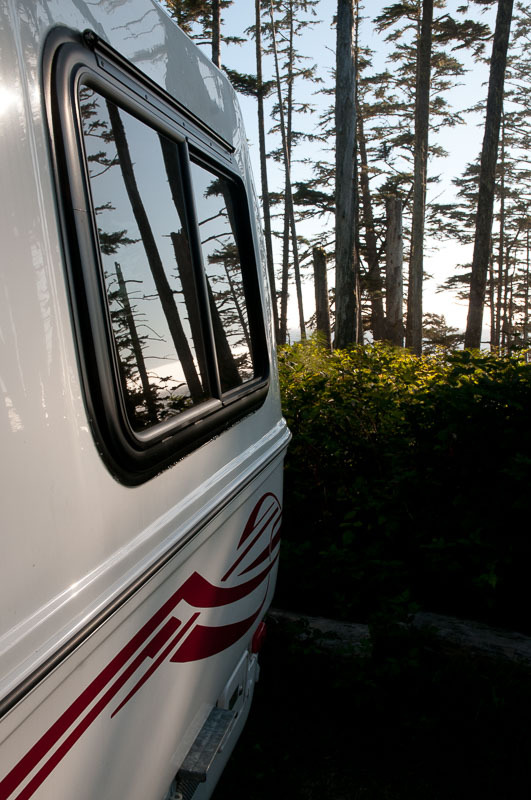 Their RVs don’t have to be as fancy and expensive as the famous and expensive ones we all know about but at least offer choices from the marine world as options and slowly integrate some of their better technologies. Besides fiberglass did you do cabinetry on the yachts as well ? How interesting. Glad you have a passion for this and like working with your hands. Also glad you are retired and enjoying life. May you be in good health and enjoy your passion till at least 100. Thanks for the kind words. I do like boats, just can’t afford them, so cameras, lenses and photos are the next best. I do enjoy the process of capturing an image and being surprised by finding things hidden in it. As with wood work, I do like the creative element. I agree about the RV industry, some parts are very stuck in a rut, no R&D, no vision, just continue to make the same thing year after year. Others are slowly realizing that customers want something better and try to inovate. Unfortunately, some of the smaller companies that are successful with good ideas, products get bought up by the big guy and the products get cheapened or are allowed to die. I have lost an hour of my life reading & oohing & awwing through this entire post. I don’t even own an Escape, yet. When we do buy one, I hope, as Santiago said, that ETI has incorporated some of your brilliant and beautifully crafted tweaks. Absolutely beautiful…… can we bring you an Escape 5.0 and have you make modifications for us? As the new owner of a 2010 5.0 I’ve found your website to be of immeasurable inspiration. Not only have you done such a fantastic job of documenting your projects, and explaining how each was done, and with such informative photos, but the results are just stunning! I’ve spent hours scouring every photo and description…Thank you for sharing your talents and solutions in such a wonderful site. Your skills are evident in the beautiful results.